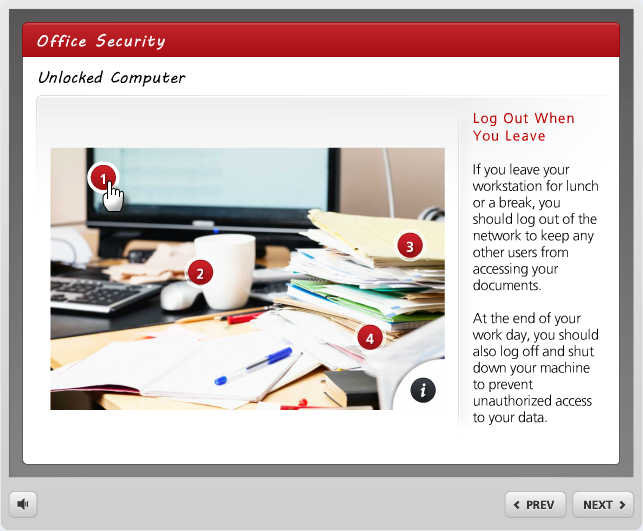 Steps: Located on the left side of the screen, this panel is used to manage labels for your interaction. Preview: Located at the top of the middle section, this panel is used to arrange markers on the image. Text: Located at the bottom of the middle section, this panel is used to add text to each label. A Labeled Panel interaction is an image with one or more circular markers highlighting important areas of the image. When learners click a marker, a label with additional content displays on the opposite side of the screen. 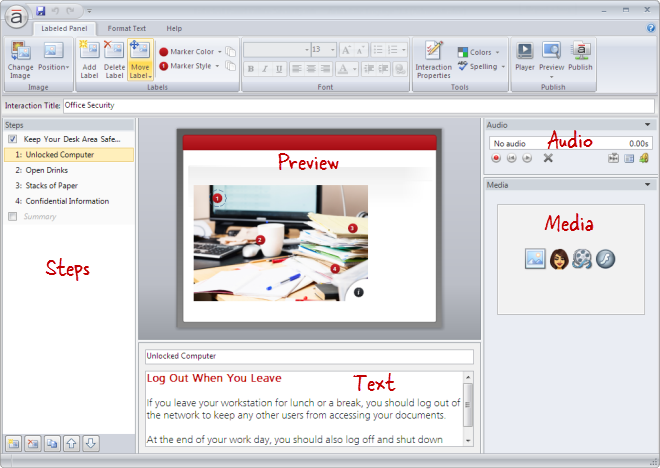 Labels can contain text, audio, pictures, characters, videos, and Flash files. 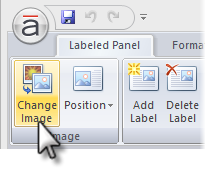 Go to the Labeled Panel tab on the ribbon, and click Change Image. Browse to the image you want to use, and click Open. 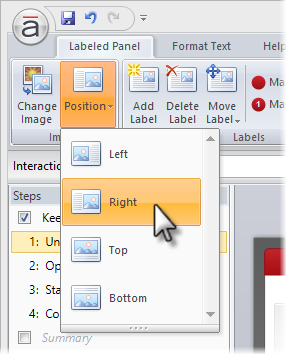 Go to the Labeled Panel tab on the ribbon, and click Position. 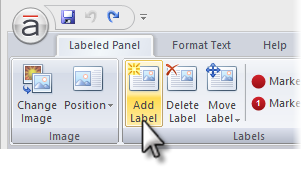 Go to the Labeled Panel tab on the ribbon, and click Add Label. 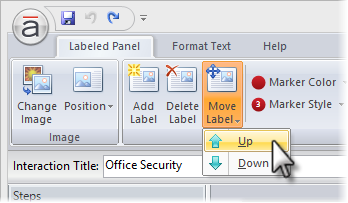 Double-click the label in the Steps panel to open it for editing. Enter the new name, and press the Enter key. 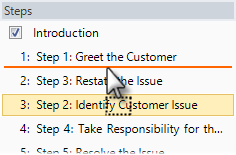 Select the label in the Steps panel, and type the new name in the title field at the top of the text panel. There are two aspects to arranging labels and markers: sequential order and spatial layout. Sequential order refers to the order of labels in the Steps panel, which is the same order in which they'll appear in the published output. Spatial layout refers to how labels are distributed across the image. Drag them to a new location. An orange line will move with your mouse to indicate where the labels will be when your mouse is released. Go to the Guided Image tab on the ribbon, click Move Label, and select either Up or Down. Spatial layout is easy to control. Simply drag the markers to a new location on your image in the preview panel. Marker Color: Choose one of the predefined colors, or click More Colors at the bottom of the drop-down and specify a custom color. 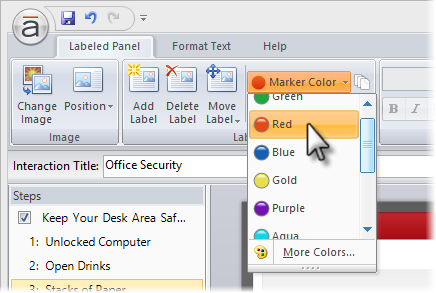 To use the same color for all markers, click the Apply to All button to the right of the Marker Color drop-down. Marker Style: This changes the icon that appears on the marker. Choose from over 200 icons. 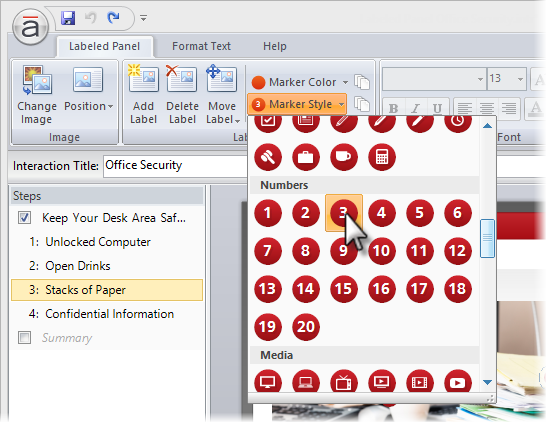 To use the same icon for all markers, click the Apply to All button to the right of the Marker Style drop-down. 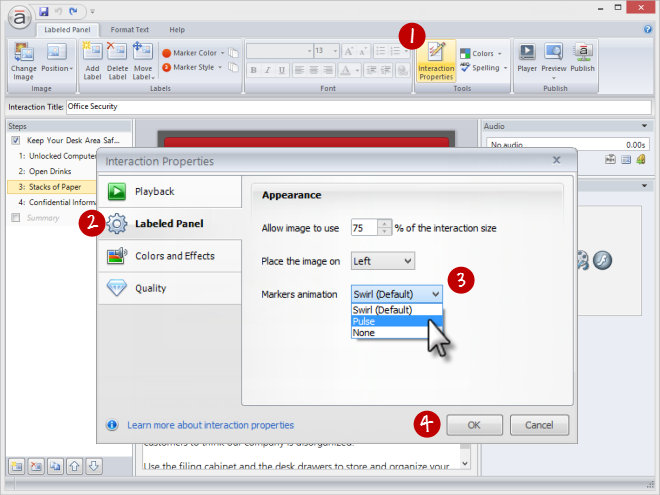 Go to the Labeled Panel tab on the ribbon, and click Interaction Properties. Note: All markers in the same interaction use the same marker animation. 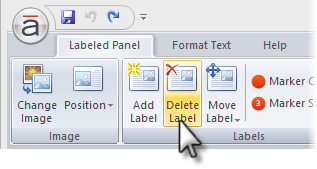 Go to the Labeled Panel tab on the ribbon, and click Delete Label.